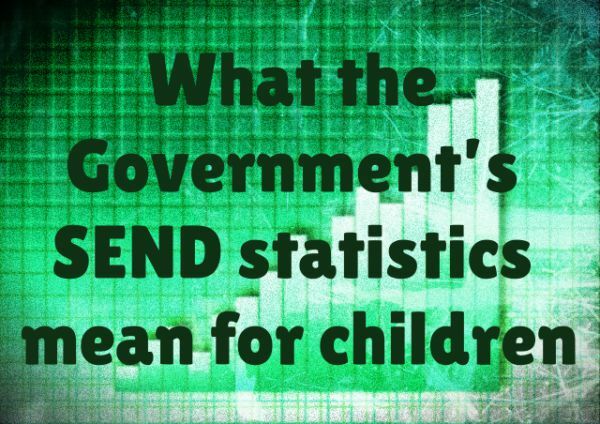 In my December blog I shared that I would follow up on the government’s SEND figures for schools. These are released annually in early summer and are based upon returns from all schools in England, made each January. Special Educational Needs and Disability figures featured fairly highly in this white paper. Whether they can be translated into actions is of course a different matter. I steer clear of politics where I can and remain focused on improving outcomes for children with SEND whatever the system may be. In my previous blog on whether academies operate non-inclusive policies, I shared that we shouldn’t use academies or schools as a generic term because they are all different and we can find good and poor practice in both. The important thing is that improvement is driven forward wherever the children are. I’ll write more on this in due course but I feel that whatever the system, the important thing to focus on is how we can join together to further improve outcomes, find opportunities, use the law, create partnerships, recognise good intentions and build upon them. From 2007-2015 there has been a year-on-year increase in the number of children attending special schools. Between 2010 and 2015 the number increased by at least 13,500 children. In 2010 across England’s 1054 special schools there was an average population of 84 pupils. In 2015 there were 1040 special schools and the average population was 100. The overall increase in numbers of children in special schools in the last five years is mainly in the areas of severe and profound needs and autism. For children identified with a primary need of Severe Learning Difficulty, the number in special schools has increased by just under 4,000 children over the five years 2010-2015. The number in special schools identified with a primary need of Profound and Multiple Learning Difficulty has increased by just over 1,000 children. The number in special schools identified with a primary need of Autistic Spectrum Disorder has increased by over 8,000. These are really significant increases. When the SALT Review (Independent Review of Teacher Supply for Pupils with Severe, Profound and Multiple Learning Difficulties SLD and PMLD) was published in 2010, there were 38,000 children with these types of needs in English schools. There are now 43,000 – that’s a 13% increase in five years. Turning to those with a primary need of Autistic Spectrum Disorder, the population in all schools in England in 2010 was just over 56,000. In 2015 it had increased to over 90,000. This has massive implications for policy and practice in schools. In July 2015 the Department for Education (DfE) published its National Pupil projections data. This predicted a 17,000 increase in the numbers of children in special schools by 2020 and a further 10,000 in the five years following that. All of us know that more children are surviving pre-term births and, with advances in medical science, more children with severe and profound needs are entering schools. These statistics really evidence the reality of that increase. In terms of autism we all also know that understanding has improved and certainly this is impacting on numbers of children diagnosed with autism in schools. There is a debate over how much this means autism is actually on the increase and how much this apparent increase is about more effective diagnosis. The biggest area of concern here is strategic. Put simply, how are we going to accommodate these increasing numbers and ensure that the children and their families are well served? No wonder that our special schools are full to the brim and parents often struggle to find places. There really needs to be a strategic review at the DfE on this issue. For those children with the most profound needs there are clearly issues for joined up working between education, health and social care. I spoke to a colleague of mine at the DfE last week – a good guy who has a real focus on, and empathy for, SEN but all he could say was that he hoped some of the capital funding being made available would go to special schools. I am forever the optimist but we have some big challenges to face for our special schools in terms of these increasing numbers. Whilst highlighting the challenges I think it’s important to recognise that that 92% of maintained special schools in England are ‘good’ or ‘outstanding’; more than in any other sector of education. That’s because they have good or outstanding teachers and leaders. I’m sure they will rise to the challenge and we can all support them to do so. Malcolm is a National Leader of Education and Chair of Programme Board for Whole School SEND. He's former Executive Director for SEND & Inclusion at Academies Enterprise Trust (AET) - the UK’s largest academy chain and now runs his own education consultancy, Firmament Education. He's worked in the field of SEND for over 30 years and in that time has worked in adult provision, mainstream schools and special schools. He has worked in with children throughout the age range and with learning difficulties ranging from moderate to profound. Malcolm has been a Headteacher of three schools and one federation. He is a Member of the National SEND Forum and Patron of the Centre Algarve holiday centre for people with special needs. Malcolm is a National Leader of Education and Chair of Programme Board for Whole School SEND. He's former Executive Director for SEND & Inclusion at Academies Enterprise Trust (AET) - the UK’s largest academy chain and now runs his own education consultancy, Firmament Education. He's worked in the field of SEND for over 30 years and in that time has worked in adult provision, mainstream schools and special schools. He has worked in with children throughout the age range and with learning difficulties ranging from moderate to profound. Malcolm has been a Headteacher of three schools and one federation. He is a Member of the National SEND Forum and Patron of the Centre Algarve holiday centre for people with special needs. Since one of the benefits for disabled and special needs schools is the small numbers, then clearly more need to be built, and on the figures above they need to be built as a matter of urgency. 17,000 pupils at a rate of 100 per school is 170 new Special Schools by 2020, with a further 100 in the next 5 years. In this age of cuts, will the Government bother, or will they pressure currently available SEN schools to expand, reducing the ability of those schools to provide an acceptable level of care and education for SEN children but solving the problem in the cheapest way possible? I sense you are a nice bloke Malcolm but clearly you have a vested interested in supporting the Government’s latest White Paper. I read your article with the understanding that it was written through that particular prism. The increases in certain groups of SEND pupils are startling, for sure. However your article fails to explore the potential negatives associated with segregated education or whether schools are ditching any efforts to make schools more inclusive as a result of Government policy. How does their policy promote an inclusive society and understanding and tolerance of different/diversity long term if children and young people with the most complex needs are no longer visible in mainstream settings? This a genuine question. If you subscribe to the social model of disability then you must see why this is problematic. I write as parent of an autistic child who was able to attend a mainstream primary thanks to the school being committed to inclusion and autistic children. My son definitely benefited as did his non SEN classmates. However we were forced to look to a specialist school for secondary because the local academies were so rigid and unwilling to flex to accommodate this needs. That was a sad, sad moment. I know parents of autistic young people truly committed to inclusion right now battling daily to get their children’s needs accommodated in secondary schools (which are mainly academies around here). They are struggling to get teaching differentiated despite their kids having statements and EHC plans. Even seemingly ‘minor’ academy policies like barring parents from being able to use email to communicate with staff working with their children (including the SENCO and school based specialist teachers) militates against true inclusion and true partnership working with parents. We also get ludicrous situations where local ‘high performing’ academies are calling Disability CAMHS services to ask for help because a Downs Syndrome pupil is not doing their homework. I think an SNJ article exploring this would be useful.